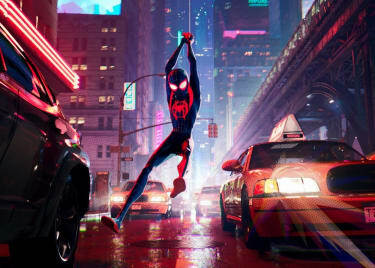 Your friendly neighborhood Spider-Man is swinging back onto the big screen this fall in SPIDER-MAN: INTO THE SPIDER-VERSE. What? Another Spider-Man? Yes, but don’t worry – this animated adventure has nothing to do with the live-action Spider-Man movies or the Marvel Cinematic Universe. You don’t need to have seen any of those films to enjoy this one. 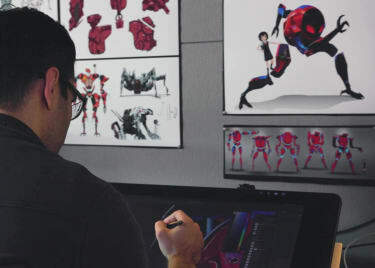 Still, it might be helpful to get to know some of the new faces from INTO THE SPIDER-VERSE, which takes place in an alternate universe with a version of Spider-Man we’ve never seen on the big screen before. 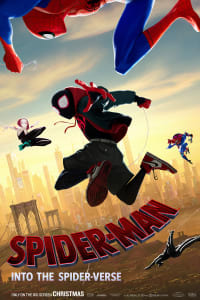 INTO THE SPIDER-VERSE follows Miles Morales, a 13-year-old teen voiced by Shameik Moore. He has a normal life with his friends by day. 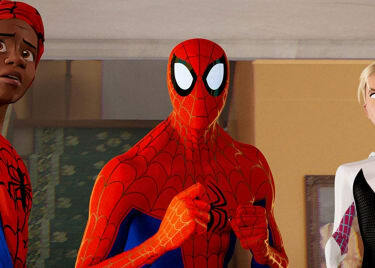 By night, he’s learning how to become the crime-fighting hero known as Spider-Man. Peter Parker is still Spider-Man! There are multiple universes in INTO THE SPIDER-VERSE, and everyone gets its very own Spider-Man – which sounds pretty great, actually! In his universe, Peter is a little older than we’re used to seeing and the years of fighting crime and super-villains have made him a bit jaded. When this Peter meets Miles, he’s reluctant to become his mentor because he knows the burdens that come with having those super-powers. And yes, Aunt May is still around – and voiced by the legendary actress Lily Tomlin. Every Spider-Man needs a foe, and the big bad guy in INTO THE SPIDER-VERSE is really big. He’s Wilson Fisk, a New York crime lord also known as Kingpin. If you’ve seen Marvel’s Daredevil series on Netflix, you might recognize that name – Kingpin is played on that show by Vincent D’Onofrio. He’s also one of the best-known Marvel villains, and he’s been fighting Spider-Man and Daredevil for a long time in comics, TV shows, and movies. In INTO THE SPIDER-VERSE, Miles’ dad Jefferson and uncle Aaron used to work for Kingpin. Jefferson left the life of crime behind when he met his wife, but there are suggestions that Aaron still has ties to the crime boss. After Miles discovers that there are multiple universes with different versions of Spider-Man in each one, we get to meet a few of them – and they aren’t always men. There’s Spider-Man Noir – a darker take on the famous hero who fights crime in 1933 and is voiced by Nicolas Cage. In another universe, Peter Parker’s friend Gwen Stacy (Hailee Steinfeld) is a Spider-Woman known as Spider-Gwen. There’s also Peni Parker, a Japanese-American middle school student who was adopted by Aunt May and Uncle Ben when her parents died in her own universe. And last, but far from least, is Spider-Ham – a talking, crime-fighting pig (yes, really!) voiced by comedian John Mulaney. All of these Spider-People (and animals) will help Miles on his journey to becoming one of the greatest heroes in the world (or his version of it, anyway).